On this website you can download REFERENCE CREATOR, a neat MATLAB application which makes finding and formatting references easy as a piece of cake. YOU DO NOT NEED MATLAB OR A MATLAB LICENSE TO RUN THIS SOFTWARE. This software will create a complete reference list by just copy-pasting your article with the in-text citations! You don’t need to waste time organizing a folder with pdf file, you don’t need to go online to look for any single reference, you don’t need to waste hours to match every citation with every reference! Just copy and paste your text! 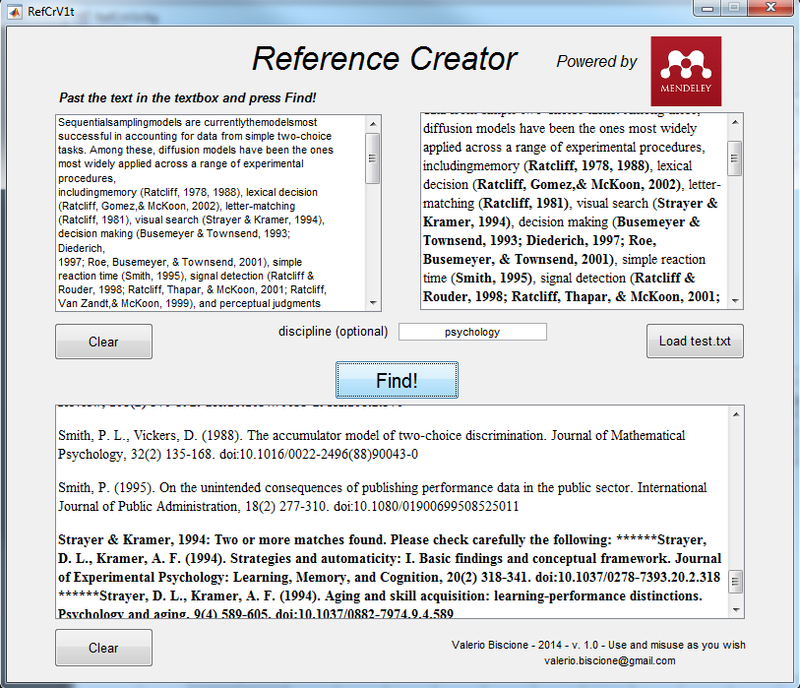 Reference Creator has been developed with MATLAB. Even though MATLAB it’s a commercial language and the license could be very expensive, this software is free to use for everyone, with or without a MATLAB license. For information about recognized citations please visit the INSTRUCTIONS page. Briefly, most (almost all) of the APA style in-text citations will be detected. This software has been developed as a side project from my PhD. I am a researcher and research involves writing papers. Writing paper is (for me) a boring task, but not as boring as organizing the references of an article. This is probably the most boring task ever in my field. I know that a lot of people are using Latex which provides a convenient way to organize citation and references. However, for those people who still don’t use Latex, my application can be quite useful. The idea is that you write your article using some text editor, putting the citation in the text while writing, for example (Biscione et al, 2013) or “see Biscione and Carmantini, 1968”. However, since we are all quite lazy, we never write down at the same time the reference, postponing this tedious operation for the future-self. This is where my software comes in handy. You can just copy and paste your text in the box within the software, and press Find! The software will recognize (almost) all the citations in the text, will connect with the Mendeley database and will look for the most likely paper, given the authors list and the year (if provided). It will then generate the list of reference. As far as I know, no other software provides this service: they usually require the user to have a folder with all the pdf files, in order to connect the citations with the articles and then build the reference. This is not a convenient option for lazy or unorganized people like me. Of course, this process is dangerous: it can happen to find two different papers with the same author and same year. When this happen, the reference will be returned in bold with a warning and two possible candidates. Sometime, for limitation in the Mendeley database (or for a mistake in the name), no reference will be found. In that case a no good match found warning will be issued in red. Some suggestions are presented in this case as well. Some other time, a “reference” will be found that is not really a reference. For example, if the text contain the sequence “as shown in the Journal of Vision (2007)“, Vision will be recognized as an author and a reference will be looked online, giving in most of the cases a no good match found warning. You can just delete this reference. The main point is to have a list of references (with or without warnings) that you can improve. This will make the process of creating references a lot easier. The source code is completely open. You can download it, change it, publish it anywhere. It would be nice if you acknowledged this website. However, remember that MATLAB is not free, and you need to have a copy in order to play with the source code. Many thanks to Christopher Germann for pushing me to put this thing online, instead of just having it rotten on my hard drive. He provided for the previous domain and created most of this template. Many thanks to Yair Altman for his wonderful website and for his neat piece of code, FindJavaObject. Finally, many thanks to Giovanni Sirio Carmantini, who, with his immense knowledge and unshakeable willpower, inspired me to spend my time on this side project instead that on my PhD.